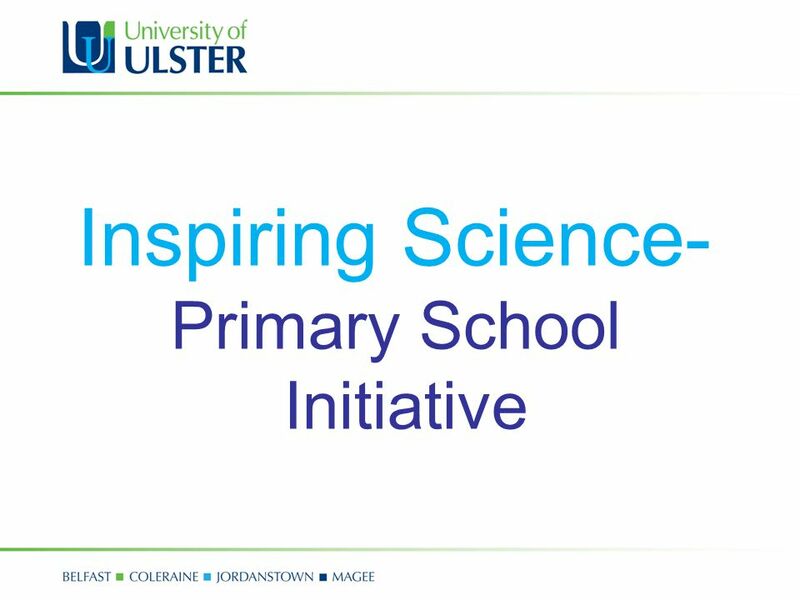 Inspiring Science- Primary School Initiative. Inspiring Science In 2008, Science in Society hosted 15 "inspiring science" shows at the Magee, Jordanstown. 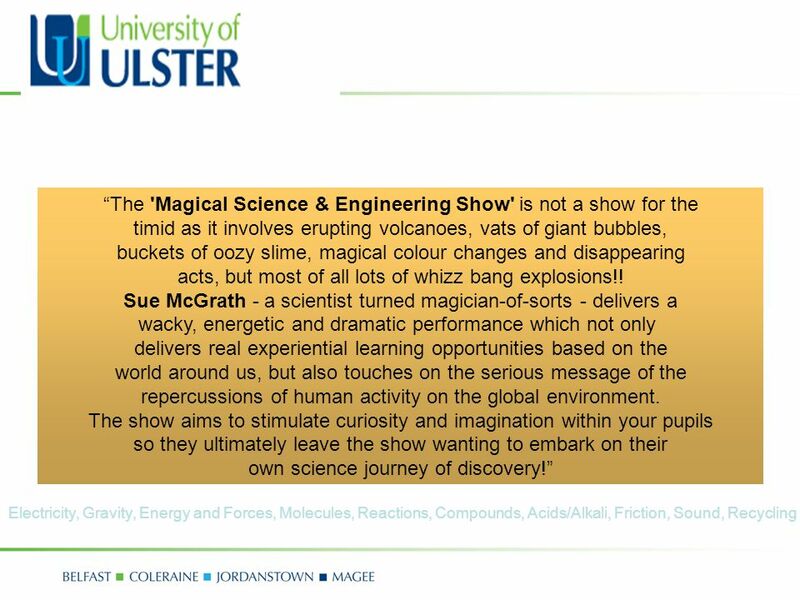 2 Inspiring Science In 2008, Science in Society hosted 15 "inspiring science" shows at the Magee, Jordanstown and Coleraine campuses for primary school children, aged 9-11 in Northern Ireland. 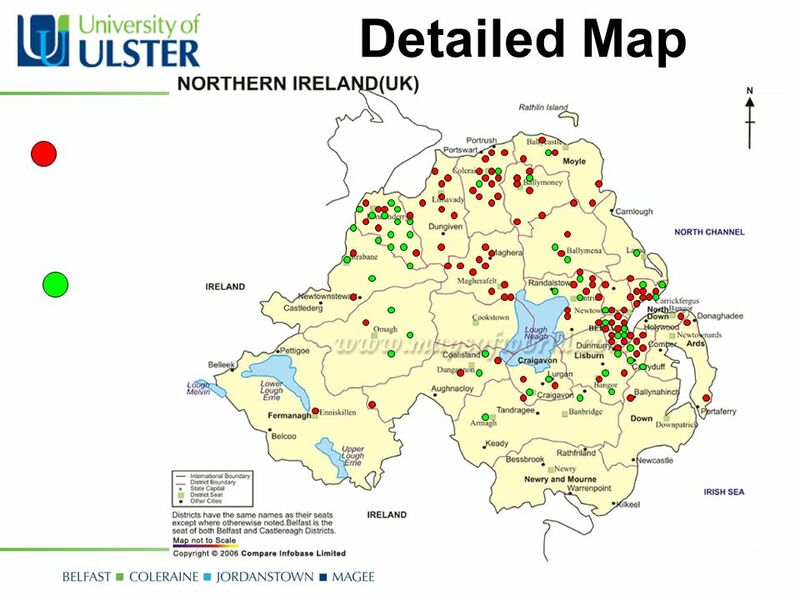 4848 pupils from 106 schools attended the events. 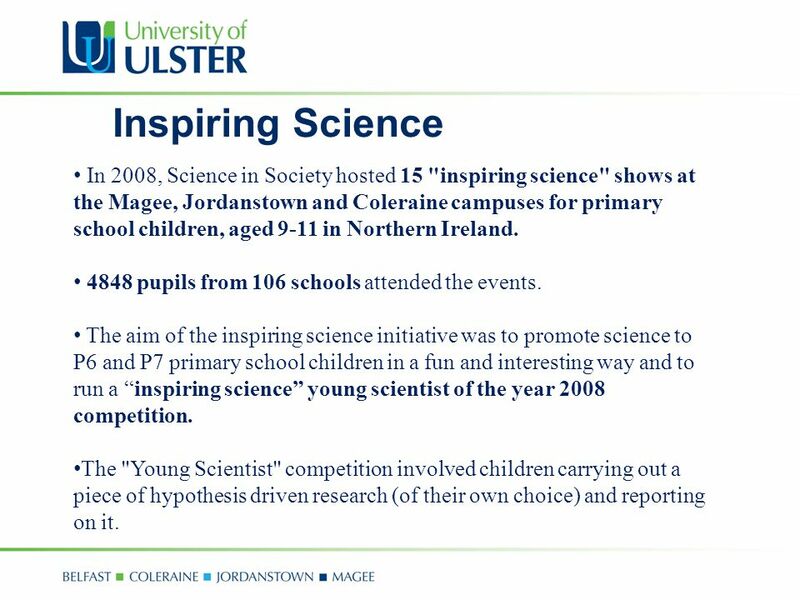 The aim of the inspiring science initiative was to promote science to P6 and P7 primary school children in a fun and interesting way and to run a “inspiring science” young scientist of the year 2008 competition. The "Young Scientist" competition involved children carrying out a piece of hypothesis driven research (of their own choice) and reporting on it. 7 “It was very important to learn… I loved it!! 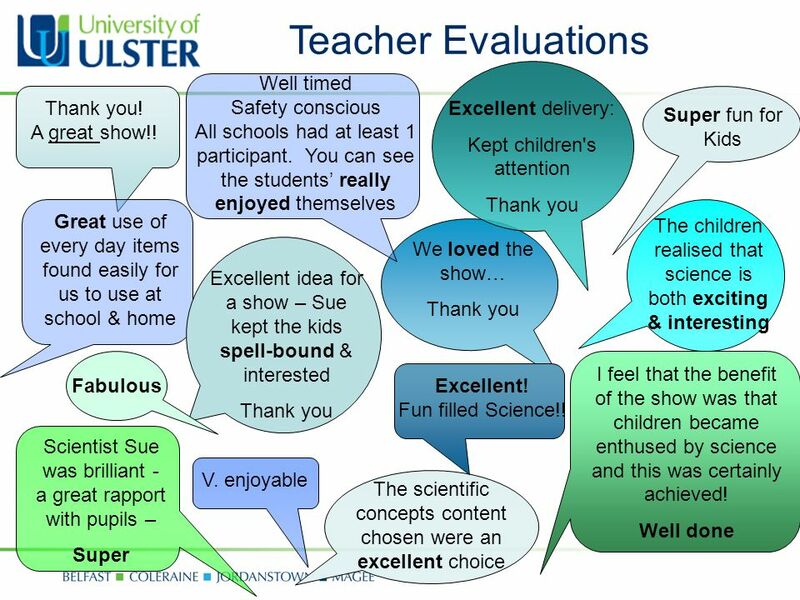 !” “It was absolutely amazing” “It was fantastic and I learned a lot of things.” “It was the best science show EVER!” “It was the best show I’ve ever seen” “Thank – you very much… after I watched the show I now know science isn’t boring” “It was very good and I hope you can inspire more schools and it couldn’t have been any better… Thank you!” “It was weird wacky and wonderful” “I thought it was Brilliant, Excellent, very, very Good “ “100%” “I would love to see it again” “It was amazing… I now want to be a scientist when I’m older” 5 * Student Evaluations Thank you for the fun stuff we learnt about science, it was SO COOL!! 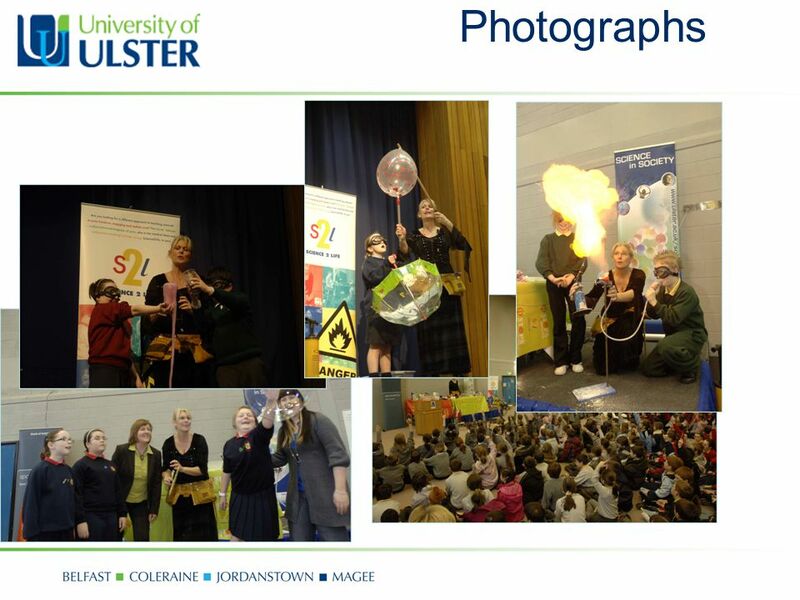 Download ppt "Inspiring Science- Primary School Initiative. 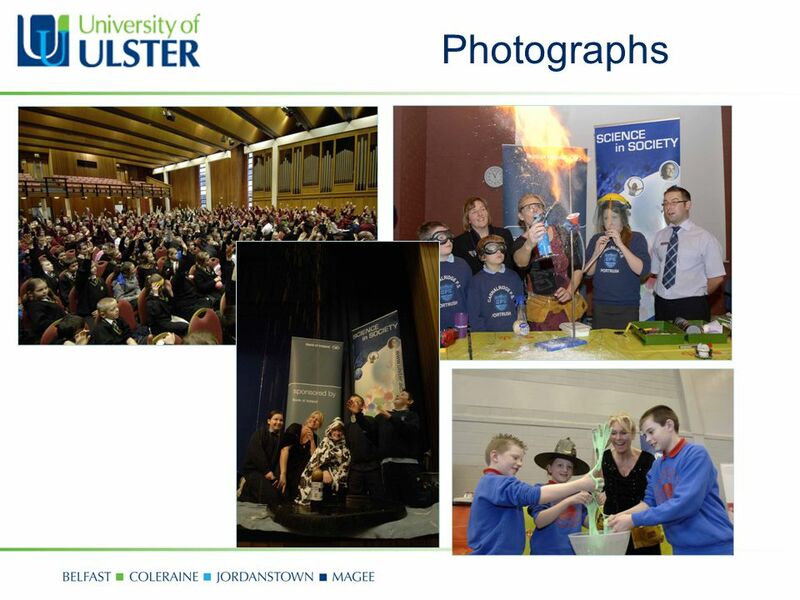 Inspiring Science In 2008, Science in Society hosted 15 "inspiring science" shows at the Magee, Jordanstown." Mantle of the Expert - when you hear that engine drone “Children are young, but they’re not naive. And they’re honest. They’re not going to keep awake. I think this is a great school with well- behaved children, love everything about it. Loving the school so far and my son really wants to come here. Open. Australian Federation of Modern Language Teachers Associations Inc. This work was funded by the Australian Government Department of Education, Employment. Author: Merle Angela S. Nagrampa. MYSELF MYSELF I’m a happy person, Energetic. I love adventure, nature fascinates me. Having ten siblings is not easy. Northern Area Partnership (NAP) Conference 2011 ‘The Future of UK Skills - the challenge for the next 10 years’ York, 20 th – 22 nd May 2011 Thank you. EARTH 2008 Teachers’ Workshop Sponsored by MBARI, C-MORE & A-STEP with logistical support provided by CIOSS & OSU Partnership between teachers & scientists. Feedback from the review of BBC Children’s services What you told us and what CBBC plans to do. The active table Contents What is the Activ Table? Promethean (activ table designer) Facts about the Activ Table Good bye and thanks for watching. The Odyssey Presentation by Lalita Sudhakar and Bettina Kinchant at the LIANZA Waikato/Bay of Plenty Region Weekend School Gisborne, May 2014 Lalita. Some very significant numbers 15/85 80/ ,277 1,934 Some more……..
@imascientist Funded by the I’m a Scientist, Get me out of here! 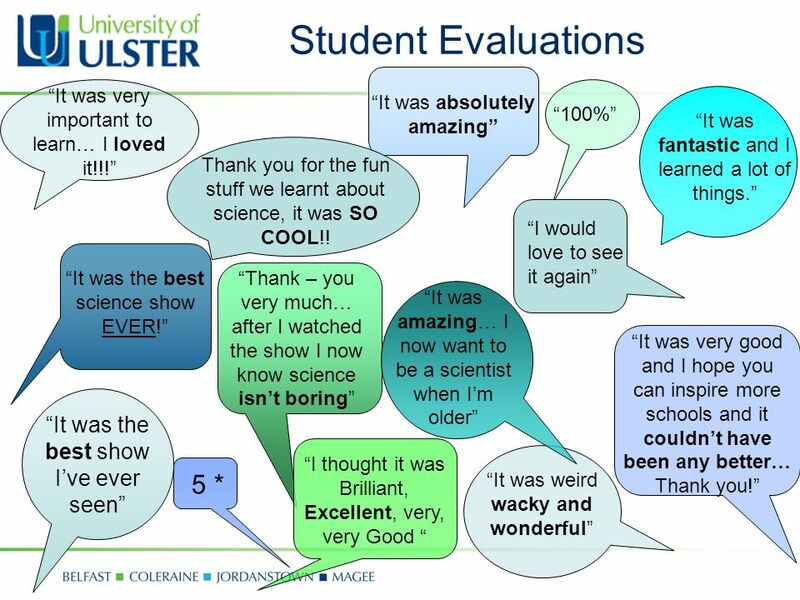 Free, award-winning, online science engagement and enrichment. GRID Glenbow Ranch Inquiry Day May 29, Our desire was to create a day revolving around inquiry-based field study in a natural setting. Grade nine. DIRECTOR OF MEDIA RELATIONS KU DANCE MARATHON (KUDM) Jami Bechard. In the Zone Playground Training Llancarfan Primary School. Dr. Brad Harrington, ©2009 MB 110: Human Resource Management Course Evaluations Prof. Brad Harrington Boston College. Primary science at Holy Family London school of excellence. 15 Simple Habits of The Happiest People. TELEVISION.  The purpose of television is to show creativity, imagination and engage ads, inspire, excitement and generate brand royalty, and to generate.